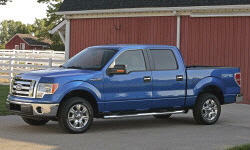 Ford F-150 Pros and Cons | Page 1 of 4 | Why Not This Car? Comfortable, tough workhorse. Delivers your goods in comfort and with style. Good MPG. Some Interior Complaints. I love my 2004 F-150, and dread the day I have to replace it. It's the most reliable vehicle I've owned and has never let me down. Living in Wisconsin, I trust it more than anyone elses vehicle to start no matter the temperature outside. Bought new F150 2 wheel drive 5.0 Flex fuel xlt. Front Suspension Control Arms rusting badley on both sides. Less than 3000 miles and 3 months on Truck. Dealer has no answer why these two parts for the suspension were never painted or coated to prevent rust..
Mediocre visibility; Too much truck! This thing gets about the same mpg as a Ranger, but its not 'handy' even in the smallest configuration. Ungainly, hard to park and not such great visibility. I put a toddler-size obstacle behind the tailgate maybe 25' and still couldn't see it out of my rear-view mirror. I knew this would be comfortable for me to drive, do everything I wanted to do. I hoped it would be as reliable & durable as the 1983 F250HD diesel I purchased new. Love the Ecoboost engine. If you aren't use to turbo lag, you might find it a bit annoying at first, but once you get use to it you'll love the torque that gets put down as the engine engages. Getting 17 mpg in 50/50 mixed city/hwy driving. We've had the F150 for 48,000 miles now. It's been reliable, comfortable, and can get decent gas mileage for a truck of this size. The Lariat trim is really sharp. The woodgrain trim, leather captains chairs, and the console shifter really set this truck apart from the lower trim lines. 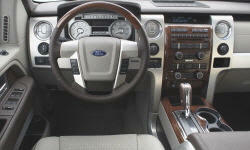 Love the tan leather/dash with silver, black, and woodgrain accents. XLTs are too plain IMO. Love the looks of this truck especially the FX2 Sport design! 13 MPG overall and and around 18 on the interstate on a good day. Boatloads of torque (0-60 in ~5 seconds malice excellent, performance-oriented 4-speed automatic; relaxed cruising at very supra-legal speeds with passing power to spare; powerful, but not overpowering, engine note. Economically moving a nearly 6000 pound vehicle with 4 wheel drive and 3:73 gears is quite a job for any engine. Even with the aerodynamics of a brick, this little V6 manages anywhere from 16-20 mpg on regular gas. It looks like a truck. Like a real truck not some car that wants to be a truck. It is the best by far in real life use. No roar at interstate speeds....very "Limo Like".